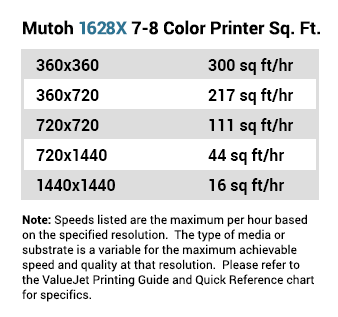 Mutoh Edition of Flexi Sign Print v12 included with printer purchase. Includes a two-year on-site limited warranty (a $6,566 value) --the longest standard warranty on any printer! The ValueJet 1624X shipping footprint is 114”x40” and has a shipping weight of 624 lbs. The ValueJet 1624X requires three 120v AC outlets on a dedicated 20A circuit. The ValueJet 1624X actual footprint is 107 inches width x 35.5 inches depth x 52 inches height. The ValueJet 1628X has the same great features as the ValueJet 1624X and offers the addition of white and metallic inks to create more stunning print applications. 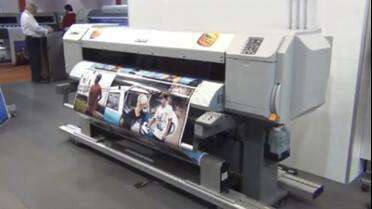 The ValueJet 1628X shipping footprint is 114”x46”x51” and has a shipping weight of 656 lbs. The ValueJet 1628X requires three 120v AC outlets on a dedicated 20A circuit. 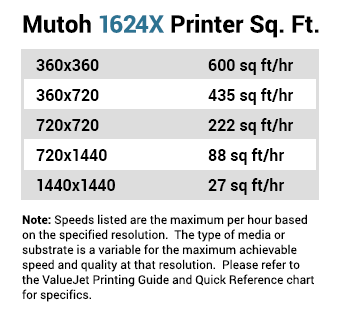 Dimensions (printer) WxDxH 106" x 35" x 50"
While the Mutoh ValueJet is a proven workhorse, every mechanical and electrical device will need maintenance and repairs during its lifetime. The Mutoh Service Warranty gives you the peace of mind that your printer will be kept in peak operating condition enabling you to focus on your business. The Extended Warranty continues the same support and coverage of the factory warranty but with a limit of one print head per year during the warranty period. Covers ink train, mechanical and electrical parts. Does not cover consumable parts such as ink, flushing sponge, media, etc. Provides coverage of up to a total service period of five years. May be purchased with the printer or at any time during the original two year factory warranty period. "The idea of having a combination printer/cutter is nice but in reality most of our customers tell us that it is inefficient to print and contour cut/plot on the same printer. Why? Because your production is held up constantly. Printing is held up by cutting. Cutting is held up by printing. Some jobs require both but often you have separate print jobs from your cut jobs. For optimal efficiency for your wrap production, buying a separate printer and separate cutter/plotter is the best choice." "Mutoh is more focused on wrap. 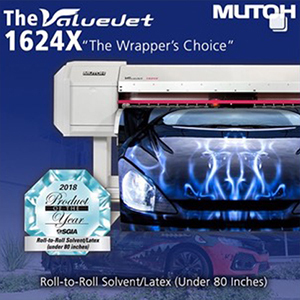 When we went looking for the optimal wrap printer to sell, Mutoh proved to us that they were more focused on wrap than the other folks. There are several excellent printers out there, but we were impressed by Mutoh's "intelligent weave" technology which really helps solid color printing look better. 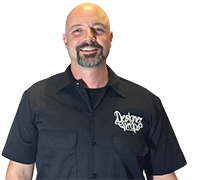 Their ink has possibly the best fade resistance in the industry, which is vital for vehicle wraps and, the ink doesn't "smell" which is vital for indoor wall wraps. They are also striving to perfect their printers by improving speed, durability and adding unique features to improve your ability to make money in the wrap business. I even like the fact that they are one of the only printer manufacturers that participate at SEMA, the largest automotive aftermarket tradeshow in the world. They go to this show specifically to be on the "cutting edge" of wrap. 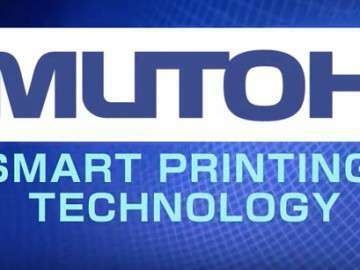 After many years of selling Mutoh equipment, we are now one of the largest inkjet printer re-sellers in the country and Mutoh's largest dealer. What solidifies our confidence however, is that so many of our customers add more Mutoh printers to their stable and/or upgrade to newer models. Focus and repeat business, the keys to any successful product and any successful brand." "Why do most people who produce wraps want a 64" printer? Primarily so that they have the ability to print on 60" material. Even though most printing is done on 54" wide material or less, some wrap jobs require a wider vinyl. For example, certain vehicle hoods can only be seamlessly wrapped with 60" material."